I have a soft spot for Heather Wardell’s novel Seven Exes Are Eight Too Many – it was the review I submitted to earn a spot at Chick Lit Central, and it was one of the first self-published books I read that demonstrated how the work of an indie author could be just as professional as a book by a traditionally published author (or even better). The concept behind it is incredibly clever and has that contemporary feel that’s so necessary for a romantic comedy to work. It’s a Survivor meets The Bachelor mash-up in which the protagonist, a woman nicknamed MC, ends up on a deserted island with a team of seven of her ex-boyfriends, fighting a tribe led by her ex-boyfriend Kent and seven of his ex-girlfriends, for a million-dollar prize. 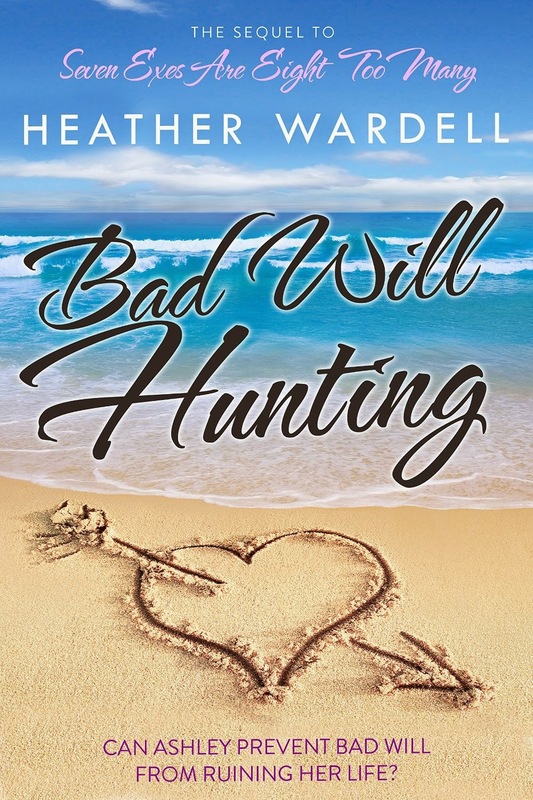 So, when Wardell came out with a follow-up called Bad Will Hunting, I was eager to read it. Not a traditional sequel, Hunting isn’t about Kent or MC, but about Ashley, one of Kent’s exes. Her story picks up at the end of the show – a show on which Ashley is nicknamed “Angry Ashley.” It’s well-earned. Ashley is still furious that she was tricked onto the show, when she thought she was trying out for a reality show called Stranded. Even worse, her cousin Brett, to whom she was as close as a brother, was going to try out for the show with her – but he died of an undiagnosed heart defect while training. On the plane home, Ashley sits next to a lawyer, Will, who takes her contract and promises to help her sue the producers. But the producers laugh at her threat and Will disappears after making her watch an episode of the show with all his friends. Now Ashley’s determined to track down Will and have her revenge on him. A common debate in literary circles is whether the main character needs to be likeable in order for readers to identify with the protagonist and the book to work. Usually this debate comes up when the main character is female, so sexism could be a factor. But the argument played out in my head as I read the book. In short, I just didn’t like Ashley – even though she has a Dickens-type back story and, if it weren’t for bad luck, she wouldn’t have any. As the book progresses, Ashley becomes more and more bitter, and keeps adding people to her revenge target list. Her external conversations and internal monologues center around how awful the world is, how bad people are, and what they deserve. Yes, Ashley is desperate and unhappy and has good reasons to be, and she does become friends with Sam, a contestant on the show who has just as much reason as Ashley to be angry and bitter. But he’s mature enough to realize that wreaking havoc on the ex-girlfriend and ex-best friend who made a baby behind his back won’t do anything to improve his situation. Ashley, however, just thinks he’s a fool for letting them get away with it. Usually the reader roots for the main character to get what she wants. In this case, I rooted for Ashley not to get what she wanted – instead, I wanted her to get over her revenge fantasies and learn from Sam’s example. Wardell’s book is well-written and structured, and as I got to know Ashley more, I found myself feeling sorry for her. But the question of whether a protagonist needs to be likeable – especially in first person women’s fiction – is one worth debating, and this is a book that’s worth reading. Wow, what an honest review!! !Wardell's book certainly sounds provocative, as your insightful review so clearly proves. Well done, both of you!